Matt Jager’s story is probably similar to your story, or the story you’re hoping becomes your story… He was a normal American eating normal American food, until he realized that he wasn't doing himself any favors. He decided that a plant-based diet was the way to health. But not only did he not know how to cook plant-based foods yet, he didn’t know how to cook, period. At Chipotle, you walk up, place your order, and your food is prepared right in front of you in 5 five minutes. And it’s not lacking in variety: meats, veggies, beans, rice… We’re covering a lot of food groups here. Humans need variety; we are generalist feeders. But when some people switch to eating clean, they have no idea how to maintain this variety. They end up eating the same salad day in and day out or turning to premade, expensive options. So Matt’s idea was to create a method that would allow someone to assemble a variety of plant-based meals in 5 minutes. 40,320 different meals, to be exact. Spicy arugula, mild spinach, crisp lettuce… You can choose anything leafy for you salad base. For your pasta, you could do anything from spiralized zucchini noodles to kelp noodles to buckwheat. For wraps, Matt suggests nori, spring roll wraps, collard leaves, or Ezekial tortillas. In your bowl, your favorite grain. Millet, brown rice, quinoa, you name it. To your base, you add 2-3 filling ingredients such as bell peppers, sprouts, beans, quinoa, lentils, spinach, cucumbers, brown rice… Whatever your healthy heart fancies. This is the fun part. You basically add 1-2 things that will make it taste good and add health benefits, like hummus, avocado, tamari, mustard, sauerkraut, tahini, or olives. Matt made a really awesome infographic that does a great job of explaining how to put together these recipes, and which foods to use. I thought it’d be fun to try my hand at Matt’s method. Normally, I find it therapeutic to spend long hours in the kitchen. But like everyone, when I get extra busy my diet suffers. So my goal with this was to use ingredients I had around the house to mimic a busy week where I don't even have time to go to the grocery store. This was the easiest for me. Because I eat salad often, I’ve already got a few tricks up my sleeves (as I’m sure you do, too!). I had some baby spinach left over from a dinner party last week. Uber healthy, prewashed, and no chopping required. High in vitamin A, it’s also a great skin food. For the filling, I added radish, fenugreek sprouts, and shredded carrot. The wow factor? A simple oil and vinegar dressing, plus some avocado. High in vitamin E and healthy fats, avocado is a great skin food and an important part of a plant-based diet. We almost always have some in the office. So far, so good. The only prep here was slicing the radishes, shredding the carrot, and chopping the avocado. You could do the first two ahead of time, but wait until game time to slice the avocado so it doesn’t turn brown. All in all a healthy and quick meal. Nothing too revolutionary yet. I’m not a big pasta eater, so I don’t know much about healthy pasta alternatives. Spiralizing zucchini into noodles sounded enticing but given that I don’t own a spiralizer, difficult. So I went with buckwheat noodles. I added red bell pepper, cucumber, and edamame as my fillings. I wasn’t sure if I was supposed to cook the vegetables. I guess if the Chipotle Method is supposed to take only 5 minutes, then probably not. This took a little more time and dishes than the salad, but the noodles cooked quickly and that could easily be done ahead of time. The bell peppers and cucumber could also be chopped up on, say, a quiet Sunday. I had pre-shelled edamame so that required no prep. I wanted a little more flavor here, maybe some ginger or even peanut butter mixed with the tamari. I only kind of liked the cucumber with the noodles. Maybe some zucchini sautéed ahead of time and stored in the fridge would be better. A few little tweaks would have made this meal really delicious. I’m not well-versed in healthy tortilla options, but I discovered some nori that had been hiding in my desk at work (enter at your own risk), so I decided to make it my wrap. For my filling, I added green leaf lettuce, which just needed a good rinse. Next, I sliced some thin strips of carrot. Again, I used avocado. On the Chipotle Method infographic they count avocado as a ‘wow factor’ ingredient, rather than a filling (probably because of the high fat content). Wow factor number 2 was cilantro. I love finding new uses for it, since it seems impossible to go through a whole bunch before it goes bad. We keep some in the fridge at work to use in green juices and smoothies (and now wraps). This wrap turned out really good! I actually ended up making it every day for lunch last week and it really does take about 5 minutes. Niquita saw me eating it and wanted to photograph it for Instagram, so that's the photo you see above (before I wrapped it up). In the photo, I have it with chipotle mayo on the side, which might not technically be allowed in the plant-based Chipotle Method, sorry. My current favorite way to enjoy it is with pickled ginger. So I guess I'm adding extra wow factors here, but it's still a really healthy meal. Two wraps make for an adequate lunch portion. I had had that nori on hand for so long and hadn’t thought of using it in that way. 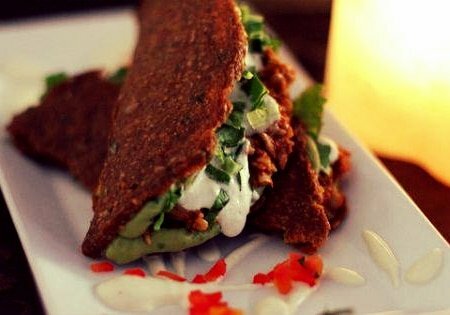 Already I’m seeing how the Chiptole Method of eating can expand your palate and help you incorporate new foods. Quinoa and I have been on a break for a while, but I decided to rekindle the flame with a Chipotle Method-inspired bowl. I also had some sun dried tomatoes leftover from a pasta of the past, so I decided to make them my wow factor for this. It seemed natural to add pesto, wow factor number two. I used more of my baby spinach in here because spinach goes well with everything. Mushrooms were my second filling. Mmm, fungus. It’s hard to cover something in pesto and have it not be delicious. This one kind of tasted like a pasta salad. Sautéing the mushrooms and spinach would be nice if you have the time, but it was good raw, too. Quinoa cooks quickly and you can do that ahead of time. The only other prep here was slicing the mushrooms. Really quick! I liked this one and I would eat it again. It’s such a simple concept, but it has actually made me look at my food differently. I love that this method inspires improvisational cooking. This is an important skill that helps reduce food waste, because when you look at what you have in your fridge and can throw something together that's yummy, you avoid buying new food while the stuff in your fridge goes bad. I also like that you can buy a few ingredients and use them in different ways throughout the week. Some of the wow factors (sun dried tomatoes, oil and vinegar, nuts) can store for a long time, so you can always have them on hand. You can prep your grain and chop your veggies when you have time, then you’re good to go for a few days! If you use this method, let us know what you make in the comments below! This is such a great idea to get kids to eat healthy, too! This looks great! I’m excited to try this method. 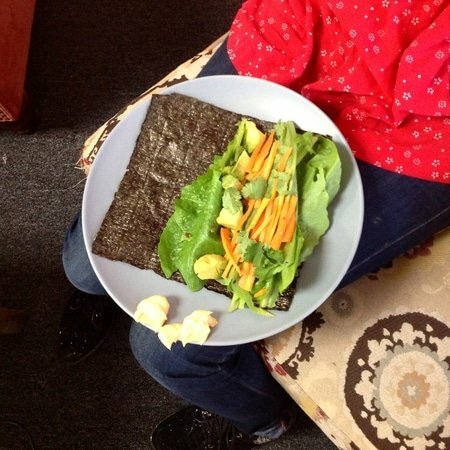 QQ – could I pack a nori wrap for lunch the night before?